As we left Warren and headed south along the western border of the Pennsylvania Wilds, we made our way towards the small community of Tionesta. Tionesta, located along the Allegheny National Forest, is known for its synchronous firefly population. Home to the annual Pennsylvania Firefly Festival, which seeks to celebrate the insects and educate people about their rarity, Tionesta swells in June when the fireflies can be seen after sunset. We had initially made arrangements to camp just outside Tionesta, about 50 minutes from Warren, but were so exhausted from our paddling excursion that we decided to stop in for the day and make arrangements to return for another time for the naturally-derived evening light show. While in Tionesta, we made sure to stop off at the Forest County Visitors Center to gather information on the area and also checked out the Tionesta Lighthouse – the only working landlocked lighthouse in Pennsylvania. 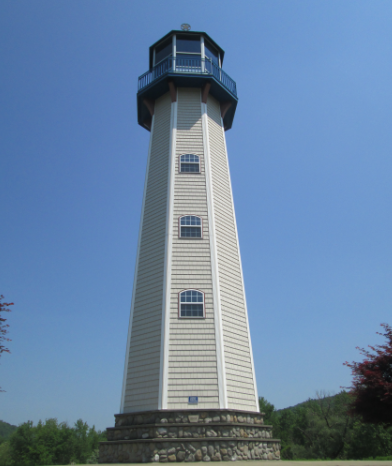 Built by Tionesta native Jack Sherman in 2004, the Sherman Memorial Lighthouse was constructed on a peninsula at the confluence of the Allegheny River and Tionesta Creek. At 75-feet tall, the lighthouse is complete with a working light at the pinnacle and boasts 76 stairs. The lighthouse was built to preserve the Sherman family heritage, and tours are offered only three times a year. We did not get to participate in a tour; however, we love going to lighthouses on our coastal vacations and thought it was so cool to see a functional inland lighthouse. The grounds around the lighthouse offer an easy 1-mile walking loop, and an adjacent building shows a free video of the lighthouse’s construction. 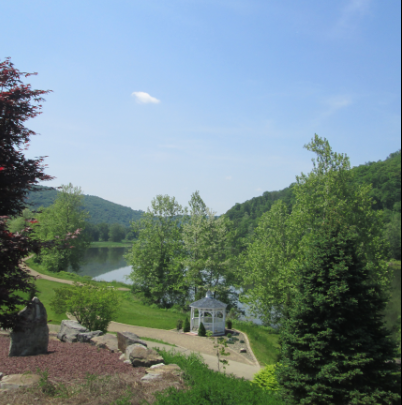 After exploring the grounds, we made impromptu lodging arrangements in Clarion, and set out on the 40 minute drive to the I-80 Frontier borough. Clarion offers a plethora of lodging and dining options, but with such short notice we decided to stay at a hotel. We checked in early, enjoyed much-needed showers, and caught up on some sleep before dinnertime. That evening we went out for a nice steak dinner at Clarion River Brewing Company, before heading back to the hotel to make plans for the next day — our last on this 5-day journey in the Pennsylvania Wilds.